Latest News: Genuine price reductions on some of our Wilmington range bespoke pieces. Beautiful handmade reproduction oak furniture, designed to visually enhance and complement your home, as well as provide essential practical solutions. Our fully bespoke pieces are genuine British-made 'originals', by highly skilled artisans. 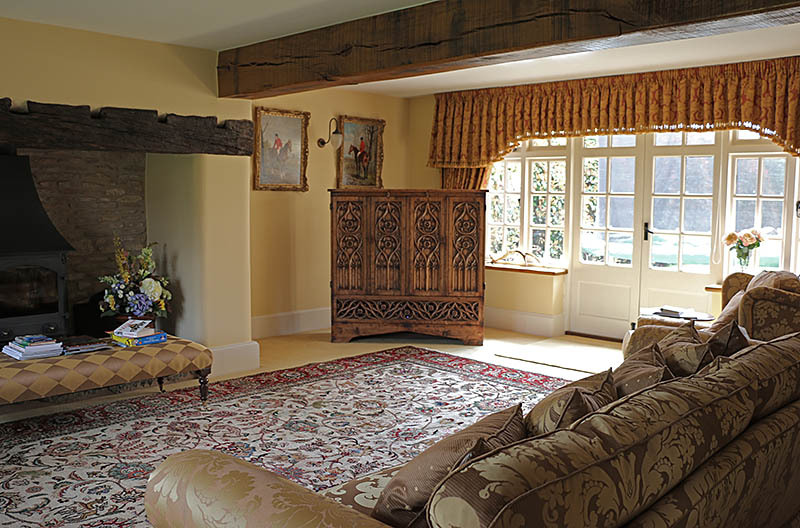 With close to 400 bona-fide testimonials, we have to be Britain's most recommended reproduction oak furniture specialists. So, naturally, we are justifiably proud to fulfil the furnishing requirements of numerous private clients, who recognise the lifetime value of owning something rather special...at a realistic price. That is neither too low, nor too high! If you enjoy the same aspirations, then why not become part of our established customer base? Which also includes interior designers, architects, The National Trust and English Heritage. 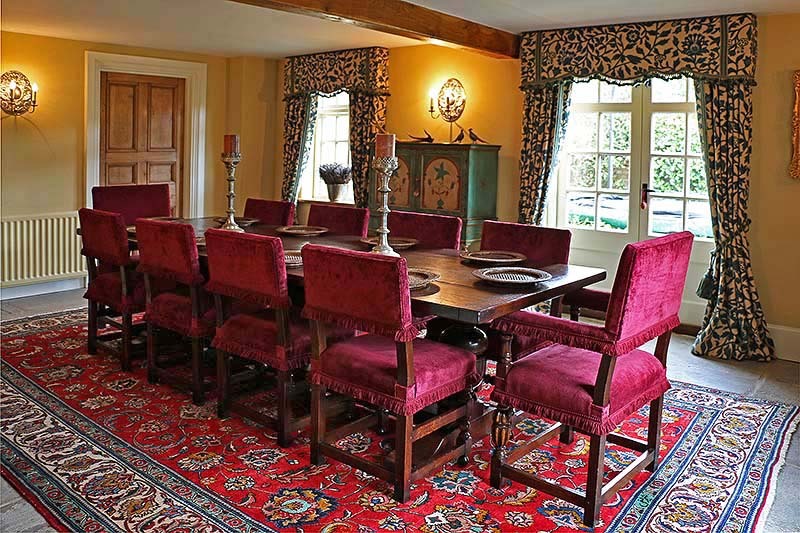 Antique style bespoke oak pedestal table and upholstered dining chairs, in our clients Warwickshire country house. To see how wonderful our oak dining room furniture would look in your home, click: Period Style Oak Dining Furniture in Traditional Interiors. One of our client's sums it up well*: "The product is not cheap but you wont find the same quality for less anywhere else"...and a couple more extol the value aspect: "They are gorgeous and worth every penny." and "We got an amazing Tudor style table on time and for a great price". Bespoke oak dresser bases, in the dining room of our clients Sussex village house. To see how fantastic our oak dressers and cupboards would look in your home, click: Period Interiors with Oak Dressers, Cupboards & Chests. Our products are in Ham House (Surrey), Sutton House (London), Osterley Park (Isleworth), Bolsover Castle (Derbyshire), Westbury Court Gardens (Gloucestershire) and Lacock Abbey (Wiltshire), as well as furnishing the private homes of discerning clients who love beautiful things. They include a world famous billionaire, singer, sports executive, TV presenter and celebrity chef (sorry, no names, client confidentiality and all that). 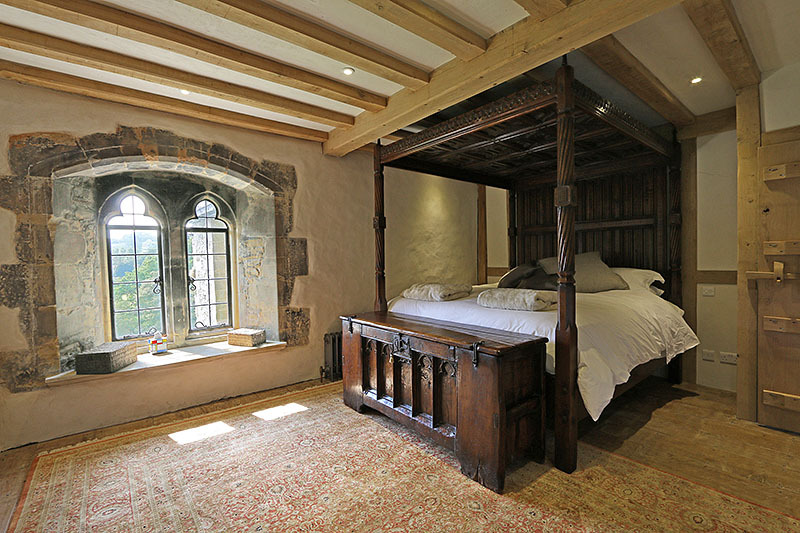 Tudor style bespoke oak chest and hand carved four poster bed, in our clients country manor house. To see how superb our oak beds and bedroom furniture would look in your home, click: Oak Bedroom Furniture in Period Interiors. 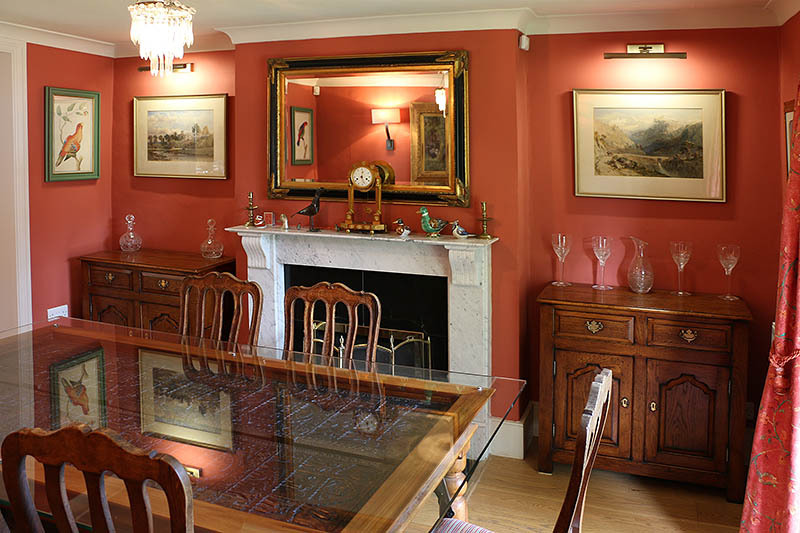 As an example of how we can help you, here's what Richard, from Warwickshire, has to say: "The quality of your craftsmanship is absolutely outstanding and the new pieces look absolutely wonderful in their new home. Throughout the process of design, ordering, construction and delivery you have been incredibly knowledgeable, helpful, flexible and understanding at every stage, in order to create the perfect product to fulfill our needs." 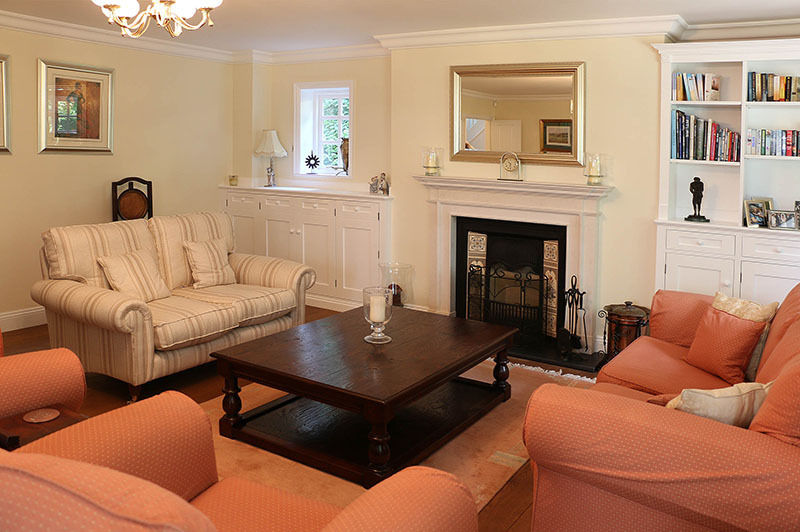 Large antique style oak coffee table, in sitting room of our clients Berkshire home. To see how gorgeous our oak occasional furniture would look in your home, click: Traditional oak occasional furniture in Period Interiors. 15th century style oak TV cabinet, hand carved and inspired by the 'Flamboyant' architectural period. To see both cupboards and TV stands, in our clients home interiors, click: Traditional Oak TV Stands and Cabinets in Period Interiors. There's no doubt that, whether you're buying just one special piece or furnishing a whole house, you can be confident that our handmade and hand finished furniture (as well as our fine art and home accessories), will reward your investment with a lifetime's pleasure in ownership. 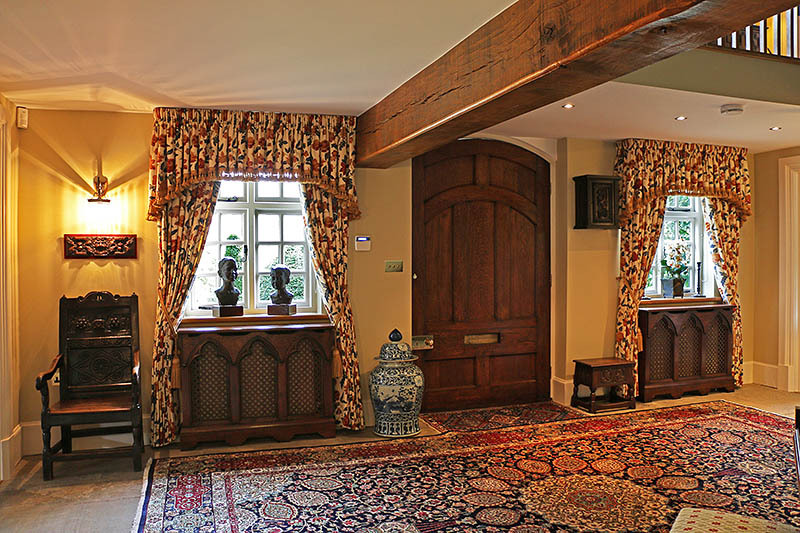 Lutyens inspired Gothic style oak radiator covers, in the hallway of our clients Warwickshire country house. For more views and other interior accessories, click: Period Style Accessories and Miscellanea. ...And don't worry if you live some distance away and can't get down to see our world-class furniture, first hand in our showroom. Mr Abson, from Gloucestershire, e-mailed us to tell us about his recently received Berwick range dresser base: "...I was very nervous given that we had only seen it on your website, but it is absolutely spot on..." and Ion from Morayshire, in Scotland, who commissioned a number of pieces, via email: "Furniture arrived in perfect condition and we are delighted with it." We feature 3 ranges totalling over 400 individual furniture designs, the largest collection of it's kind in Britain. All three ranges feature a choice of colour and ageing options and these are all included in the quoted prices. Here, you have the opportunity to invest in exquisite hand turned wooden bowls and vases, English and Italian replica pewter, traditional and period style ironwork (hand forged by skilled English blacksmiths) including candelabras, candlesticks and rushlight holders, as well as traditional style lighting including floor and table lamps... all perfectly suited to the period/traditional look.